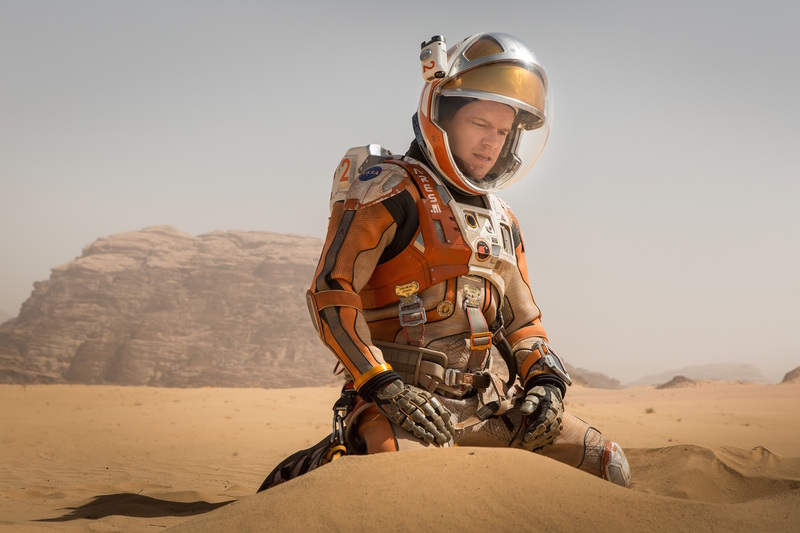 The Martian is quite simply Ridley Scott’s best film in years. We can take it as read that visually it fills the screen with all of Scott’s usual panache (and looks great on Blu-Ray), but it’s the human story which makes this so satisfying. And unlike his most recent disappointing sci-fi film Prometheus, The Martian actually makes sense. The success of the movie, in huge part, is due to the fantastic Oscar nominated adaptation of Andy Weir’s novel by Drew Goddard. It manages the unenviable feat of translating a book, which is mostly epistolary dairy entries, into something which works instead like a fictional Apollo 13. And it has to be said the shadow cast by Ron Howard’s 21 year old movie about the real NASA crisis of 1970 (where a fault caused a hole in the Apollo spacecraft and the crew and mission control to wildly improvise solutions to keep the astronauts alive) is not at all detrimental. Indeed it gives the audience a sort of shorthand, the license to believe things will be alright in the end. Apollo 13 was a movie made about a real disaster in which we know all the protagonists got back to Earth okay – that doesn’t stop it being filled with thrills, spills, tension and suspense. And the same is true here. We know full well that Hollywood is not going to make a big budget film about a character being trapped on another planet and not get him home. It’s not a spoiler to reveal the film has a happy ending. Structurally the storyline is identical to the book, just differently ordered – the pacing and point-of-view this offers are excellent. Goddard started to adapt the novel as Andy Weir was still writing it, and they became friends during the process. In a Q&A last year Goddard revealed they both discovered they were big fans of Douglas Adams, which makes a lot of sense. There is a both healthy irreverence to proceedings underpinned by an absolute respect towards the science. As unashamed science geeks the idea behind the storytelling was that it should feel real. Like it could happen. How do you grow potatoes in soil that has no bacteria, and water the plants when they eventually sprout? For the most part the folks at NASA say they got it all right (the meteorological conditions on the surface of Mars apparently being the major bone of contention, but hey, storms are dramatic right?). More importantly, the technical aspects, the machinery, all of that space hardware is absolutely spot on. If you look at photos of the International Space Station the Hermes spacecraft may look a little too roomy and polished for what is essentially a interplanetary ferry, but that is a very minor gripe. NASA themselves contributed design ideas of what might be happening twenty years from now, so who knows? It’s that very sense of “it could be” which makes the film work so well. A documentary of future events almost. Being properly grounded allows it to take flight. And, in an aspect which is often ignored, it is very funny. As Goddard pointed out during the Q&A, the moment the injured and alone Mark Watney first swears (something which he and Scott fought with the Motion Picture Association to retain and keep the PG-13 rating) is a moment where we as an audience are given permission to laugh. It’s a key moment and sets the tone wonderfully. The NASA team on Earth, led by Chiwetel Ejiofor, and including Jeff Daniels, Sean Bean, Kristen Wiig and Benedict Wong are all believably exasperated and under pressure. A supposed documentary about the disagreement between Jeff Daniels and Sean Bean’s characters, apparently made seven years after the events of the film, is an amusing addition to the Blu-Ray extras – with Sean Bean’s Mitch Henderson swearing like a disgruntled trouper about his treatment at the hands of the NASA chief. The crew of the Hermes, led by Jessica Chastain have less to do but provide solid support. But it is Matt Damon who is the centre of the film. In the book Mark Watney is a wise-cracking smart-arse, but incredibly charming with it – and he’s writing a diary so is allowed to be flippant as a kind of pressure valve for the tension. Matt Damon is not just good casting, he is perfect casting. It is one of those rare occasions in which it is utterly impossible to imagine someone else taking his place, and because he is forced to self-narrate (we don’t watch him typing, rather talking to numerous GoPro cameras stashed all over the temporary Martian base) we see the twinkle in his eye even during moments of hardship. It is a very real, and touching performance of someone pretending not to be brave. Goddard has said in interviews that if Damon hadn’t said yes (he was always top of the casting list) they may not have had a movie – a low-budget version of the story is not really possible and for budget, you need a star. It is no exaggeration to say the film wouldn’t be as good without him. Visually of course it looks great, possibly one of the least overtly showy 3D movies in years at the cinema it still takes place on a spectacular and large canvas and the 2D Blu-Ray version retains its epic scale. The colour coding which demarks the three locations (orange for Mars, blue/grey for Earth and green for the Hermes) is subtle but surprisingly effective. The special and visual effects are completely flawless throughout the film. The addition of the disco soundtrack, only mentioned in the book, is wonderful. For such a big budget movie on such a huge planetary visual scale, the film remains tightly focused on the people involved and as a result is all the more satisfying for it. It is moving, dramatic, and funny. Ultimately The Martian is entertainingly thrilling in a properly old fashioned kind of way. It’s a film which will probably remain a classic long after we actually land on Mars. The Martian Blu-Ray is out now. Extras include making of featurettes, gag reel, faux tabloid TV documentary, Ares 3 crew psych evaluations, and on ship crew video. It’s a wonderfully well paced film. And apart from the somewhat jarring Yorkshirosity of Sean Bean, well cast. Given the pretty dry nature of the novel the screenplay is a triumph. Look forward to seeing it again. And really, who cares if a storm on Mars wouldn’t blow over a paper cup? It’s fiction innit.